Identity theft is a serious problem throughout the world. 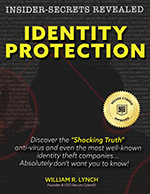 Each year, millions of American citizens have their identities stolen and their finances ravaged, totaling annual losses in excess of $50 billion. Cyber criminals are getting smarter and more advanced. The antivirus programs we once turned to for help are no longer doing the trick. Malware threats have evolved past the capabilities of modern antivirus software, but all is not lost. There are ways to remain vigilant in the face of such adversity. After all, consumer education is the key to online safety. So, what can you be doing in order to keep your online life safe and secure? How are hackers targeting you? And how will online vigilance protect your identity? With sites like Amazon.com doing fantastic business, it is clear that Americans are shopping online more than ever. What’s more, they’re often making purchases while outside the home. This can be a huge mistake which could allow a hacker into your system. It’s best to engage in online purchasing when you’re at home working with a secured password protected Wi-Fi network. Using public Wi-Fi to make purchases might seem easy and convenient, but it’s also very dangerous. If you have to use public Wi-Fi to make a purchase, consider the use of a Virtual Private Network, or VPN. This protects all of your internet activity, including data transfers like credit card purchases. Make sure that any website you’re entering financial information or passwords on are trusted and protected. Websites like Facebook, Amazon, or FDIC member bank sites are usually safe, but third party seller sites can be malicious hacking attempts that are seeking to gain access to your financial information. Also, when you make purchases on sites, they will often give you the option to check out as a “guest” or create your own account. The account only serves to give them access to your email address for future promotions, so it’s usually a safer bet to just check out as a guest. Why? Because if that site ever got hacked, all of your personal and financial information would be saved on your user account. Better safe than sorry! A common email hacking scam involves sending an email designed to look as though it came from a reputable site like PayPal or Facebook. Usually it states that there’s some kind of issue that needs to be corrected with your account and asks you to follow a link. If you click the link, either your computer can become infected with malware viruses, or it will ask you to log in to the site, thus stealing your username and password. Make sure before answering an email from any website that you check the sender’s email address. Often times hackers will try to create addresses that look like they’re coming from the site in question, but are misspelled slightly, or in a way that one might miss. Remain vigilant when checking your email and report any suspicious activity. Social media sites are crawling with hacker bots which create fake spam profiles that will send requests to various users. Once these fraudulent requests are accepted, the spam bot will send you a message, usually with some kind of offer for a service. That will contain a link which, if clicked, will lead to a malicious site that will infect you with malware. What’s more, it’s possible for individuals who have fallen prey to this trap to become unwilling pawns of hackers. Some malware can commandeer your Facebook, email, or even Skype account, sending out a series of spam links to your contacts. If they click on them, thinking it’s from you, they too will become victims. Using simple passwords only makes it easier for hackers to infiltrate your system. Make sure you’re creating passwords that use a healthy mixture of capital letters, numbers, and special symbols such as “#$%!@&”. Many hackers employ tech that attempts to crack your password by entering a series of normal words in the hopes that it will guess correctly. Also, it’s important to have different passwords for different sites. If your Amazon, bank, Facebook, Skype, and Netflix accounts all use the same password, then if someone hacks your Netflix, they’ll have access to everything, including your banking information. Another major threat you have to defend against is keylogging malware, malicious viruses that keep track of your every keystroke. It’s important to be mindful of what programs you’re downloading from the internet, as keyloggers often come in the form of a trojan horse, a virus attached to an otherwise harmless bit of software. Secure CyberID has a one-of-a-kind anti keylogging plan which provides keystroke encryption for multiple adults across both computer and mobile platforms. For more information about how you can keep your most vital information safe and out of the hands of cyber criminals, click here to contact us.